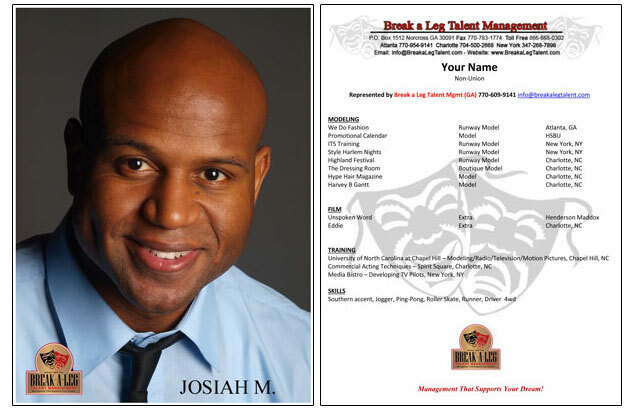 Thank you for your interest in Break A Leg Talent Management, LLC. Please pre-register by clicking the 800 Casting Database located below. If you are pre-approved, please continue to update your profiles in all databases - 800 Casting, Talent Soup, Now Casting, and Casting Networks GA / Casting Networks NY. Professionalism is key to Break a Leg Talent Management, LLC. If chosen to be represented by Break a Leg Talent Management, LLC, as talent you agree to maintain professionalism. Talent agrees professionalism is arriving promptly for auditions, maintaining professional etiquette during auditions, and while on set in production. All Registrations are subject to approval!